From the Grantham Journal, 15th January, 1916, the wedding of Ethel Whitworth to Amos Tinkler, and the home visit of four Muston soldiers including Amos Tinkler and Ernest Wakefield. 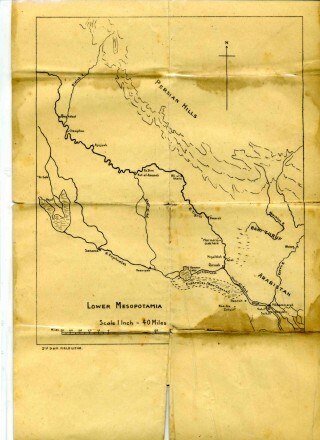 Campaign Map detailing the Lower Mesopotamia region. Ernest Wakefield was born in Bottesford, Leicestershire, on 28th August 1886. He was the son of Thomas Wakefield a garden labourer from Colsterworth, Lincolnshire, and Sarah Ann Wakefield (née Tinkler) from Muston, Leicestershire. Thomas and Sarah had married in 1883 in the Grantham district and they had three sons: John William, Ernest and Walter. Ernest’s father unfortunately died in 1889, aged 29, the same year in which Ernest joined his older brother John William at Muston Church of England School. By 1891 his widowed mother was earning her living as a charwoman and she and her three young sons, aged 7, 5 and 2, lived in Village Street, Muston, Leicestershire. Life could not have been easy. Her circumstances changed dramatically in 1893. 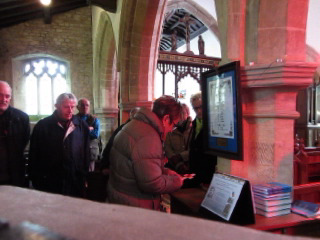 She remarried William King, an iron stone worker, who came from Woolsthorpe by Belvoir. By 1899 the family had moved to Stathern Road, Eaton, Leicestershire close to the the iron stone quarries that ran along the top of the Vale of Belvoir escarpment. Ernest’s mother had nine more children with William King: Joseph, Lily, John, Harold, Robert, Arthur, Sidney, Percy and Nellie, all half-siblings to John, Ernest and Walter. By 1911 Ernest had left home. However his brothers were still living in the family home. Walter (22) worked with his step father as an iron stone quarry man and John (William) (27) was a farm labourer. Their step brother and sister, Joseph and Lily were also no longer at home. However, John (12) and Harold (11) remained there with Robert (10), Arthur (9), Sidney (5), Percy (3) and Nellie (1). Many of the boys would grow up to work in the ironstone quarries and Nellie became the person who looked after them. Mick Wakefield, Ernest’s great nephew, remembers them as ‘big men’ who were served ‘prodigious amounts of food by Aunt Nell’. Quarrying the ironstone was hard physical labour. Ernest took a different path. Ernest enlisted in Melton Mowbray. 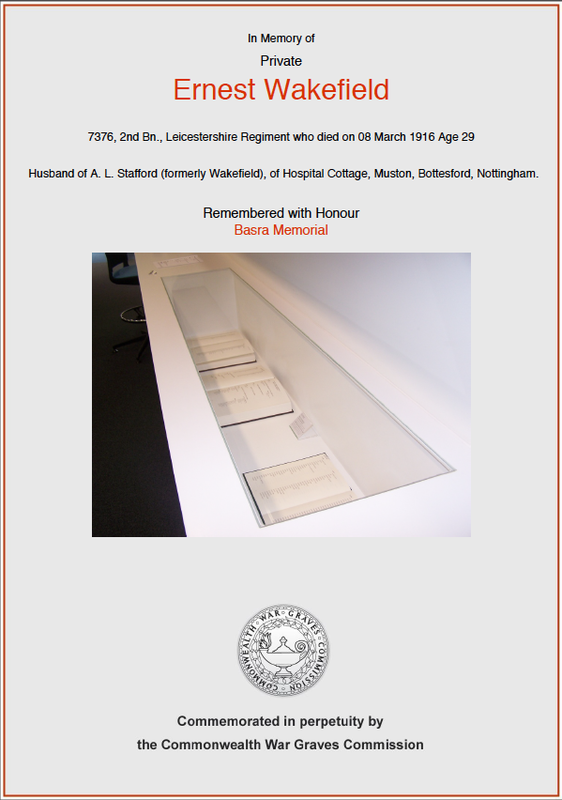 As Private 7376 he served for a year in England and then for seven years in India stationed in Madras, Belgaum, Delhi, Bareilly and Ranikhet with ‘C’ Company of the 2nd Battalion of the Leicestershire Regiment. He must have determined to live a sober life in the forces. While he was in India he joined the Army Temperance Association India (ATAI) and was awarded a Temperance Medal bearing the inscription ‘Watch and Be Sober’. 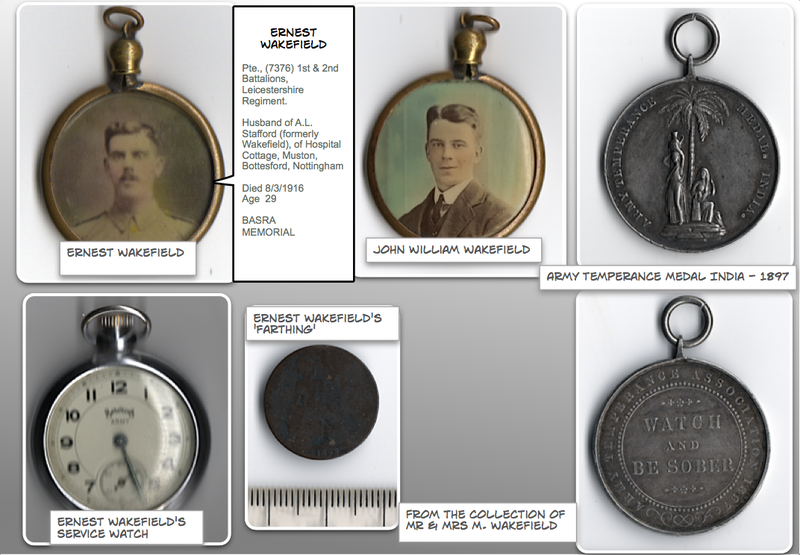 The Wakefield family still have that medal. After leaving the Army in 1912 Ernest joined the Leicestershire Constabulary. 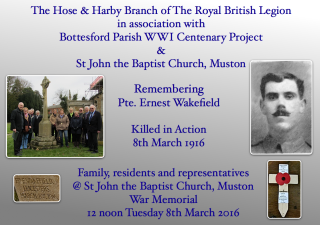 On 17th February 1912 he was best man at his brother Walter’s wedding at the Church of St. Denys, Eaton, and not long afterwards on 10th April 1912 Ernest himself was married to Agnes Louisa Tinkler at the Church of St. John the Baptist, Muston. Before her marriage Agnes worked as a housemaid for Dr. Glover a medical practitioner from Bottesford. Ernest and Agnes set up home in Burder Street, Loughborough, where Ernest was now stationed as a police constable. The couple had two children, George Ernest and Agnes (who died aged 16). Ernest was recalled to the Colours at the outbreak of war in 1914. 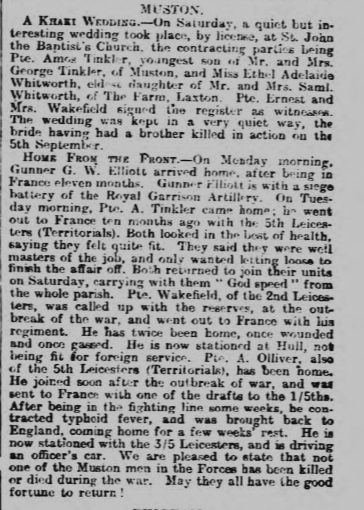 After his death on the 8th March 1916 a summary of his 1st World war service with the Leicestershire Regiment was reported in the Grantham Journal. The only detailed records of his 1st World War service that still exist are his Medal Index Card, a summary record of his service in the ‘UK Soldiers Died in the Great War, 1914-1918 and details of his back pay and War Gratuity owing to his widow ‘Agnes L’. The sum of his country’s gratitude would amount to £1 9s 4d and the award of a £9 gratuity paid 18 months after his death (the equivalent of less than £600 in total in today’s money). The Battalion settled into these conditions for the run up to Christmas. From the 14th December they started taking casualties. 14th Dec – Trench bombarded at 3pm. 20th June (…) At 12 noon they commenced projecting gas at our right Coy & firing gas shells along the whole line, wind very light, no casualties from gas which lasted till 2.00 am – a quiet day followed. 30th June A Coy heavily shelled, one man killed three wounded. Persistent shelling by “Whiz-Bangs” (light field guns) and small Hows. 5.30 pm & 9.30 pm GAS round headquarters from Gas-shells fired into roads in the rear the gas being blown back towards firing line by strong wind. No casualties, Gas caused intense smarting to the eyes but no other inconvenience. Very quickly it became apparent that those exposed to gas suffered from delayed reactions. Ernest’s exposure to gas necessitated removal to a London Hospital and home convalescence, thence home service at Patrington, near Hull, as he was deemed not yet sufficiently fit to serve abroad. On 8th January 1916 Ernest and his wife were witnesses at the wedding of his wife’s brother Private Amos Tinkler (1/5th Leicestershire Regiment). Almost immediately after the wedding Ernest received orders to proceed to Mesopotamia. He was not posted back to the 1st Battalion and its subsequent engagements on the Somme. It was at this point that he rejoined his old battalion, the 2nd Leicesters. They were sent in late December 1915 to the Middle East to combat the deteriorating position of British Forces in Mesopotamia. 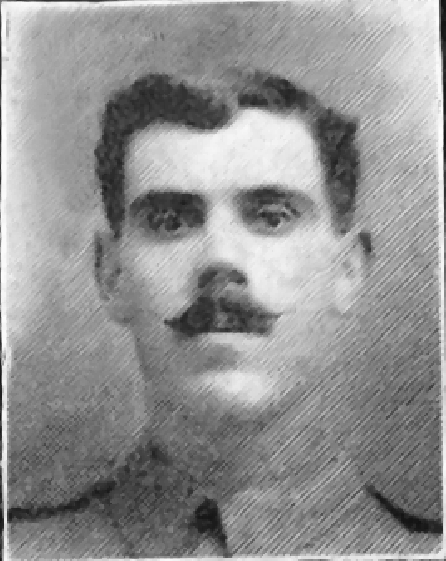 He would join another local man, Bill Sutton who also served in the 2nd Battalion in Mesopotamia. Bill would survive. Ernest would not. 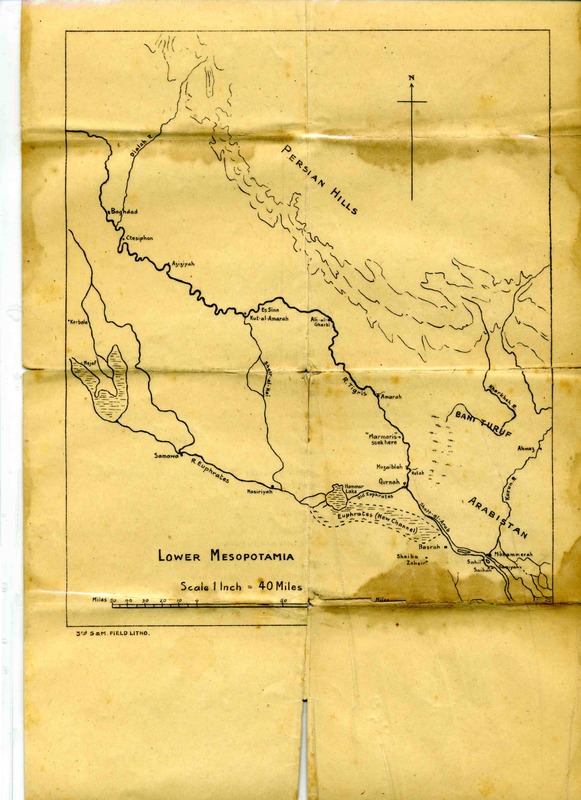 Ernest arrived in Basra towards the middle of February and travelled up the Tigris to the area south of Kut-al-Amara. 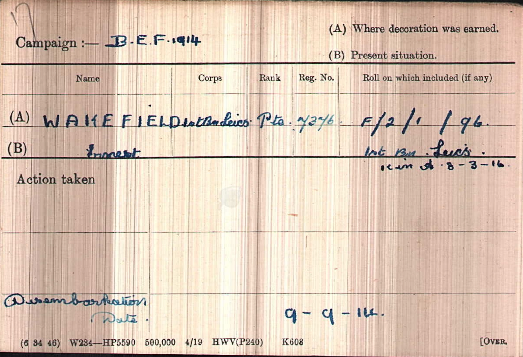 The 2nd Battalion was no longer staffed by regular soldiers. It was now largely made up of new Kitchener Army volunteers with a leavening of those with regular army experience. 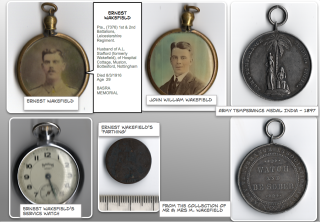 Ernest Wakefield would be a valued member of the ranks, someone with pre-war experience and a survivor of early war actions in France. It is interesting that the report of his death does not mention where he was killed. The situation in Mesopotamia was dire. The 2nd Leicestershires were sent to join the Kut Relief Force (The Tigris Army Corp). Prior to their arrival The India Corp had attempted to take Baghdad and were driven back to Kut where they were besieged. Between January to April 1915 the Kut Relief Force Force attempted to fight its way up the Tigris. Ernest arrived in time for the third attempt to relieve the besieged British force at Kut, which had resulted in muted trench warfare as the flooding season approached. General Aylmer therefore devised a plan whereby his force would cross the Tigris for a straightforward attack on the Turk-held Dujaila Redoubt, at the extreme outer edge of Es Sinn. Originally scheduled to begin on 6th March the attack was postponed for two days because of heavy rainfall. General Kemball led the main advance on 8th March. Ernest’s battalion was held in reserve until the late afternoon. They then undertook a grueling night march in full battle gear to make a surprise attack on the heavily defended Dujaila Redoubt in an attempt outflank the Turkish forces. They subsequently met stiff opposition from heavy rifle and machine gun fire. (…) The two leading Battn’s owing to heavy casualties were compelled to entrench some 400 yards short of the enemy’s position. About 10.00am Major D. L. WEIR D.S.O. was wounded and Capt R. J. McINTYRE assumed command. At 10.50am the Battn faced north west to meet an expected counter attack, formation of Battn in two lines of half Battn, B and A Coy’s in the front line with machine guns, C and D Coy’s in the second line. The counter attack did not take place. Further attempts to advance were order at 4.30 pm. another attempt was to be made to capture the enemy’s position, and all troops were to co-operate and assault at 5.00 pm. The attack took place and the front line reached a ridge about 200 yards to 250 yards from the enemy. Orders were received to dig in on the ground won. The attack on the Dujaila Redoubt failed as did the attempt to raise siege at Kut-al-Amara. On the 29th April the British Commanders sought terms of surrender with the Turkish Army. 13,000 British and Indian officers and men passed into captivity. 70% of the British and 50% of the Indian troops died during that captivity. Ernest Wakefield aged 29 was not amongst that number. He was one of the 3,500 troops killed in the failed assault on the Dujaila Redoubt. Ernest’s family did not hear of his death until almost a month later, on April 5th. Ernest Wakefield has no known grave and is commemorated on the currently inaccessible Basra Memorial in Iraq, Panel 12. He is also commemorated on the Muston War Memorial, St. John the Baptist Church, St. Denys Church and Memorial Hall, Eaton, the Leicestershire Constabulary Police Headquarters, St. Johns, Enderby, and on the Carillon War Memorial, Loughborough. Ernest’s widow Agnes subsequently took George John Stafford, another police constable from Loughborough who was separated from his wife, as her partner. By George John Stafford she had five more children, two sons John (who died in Egypt in 1952) and Aubrey and three daughters Georgina, Dorothy and Sylvia. The Stafford family lived at Hospital Cottage, Muston, Leicestershire. The family would receive some of his personal effects. A ‘lucky farthing’, a dented pocket watch and an Army Temperance medal. 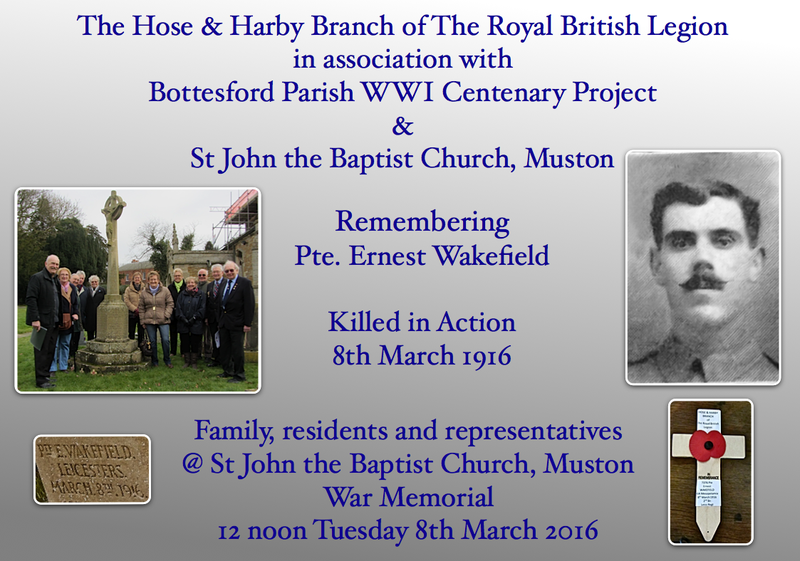 There is also a family memory that one of Ernest’s brothers (John) also served in France. Ernest and John saw each other once as the columns they were part of marched past each. One brother was going up the line as the other came out. The exact circumstances of this memory are not known but its telling must have brought some comfort to his wife and close family. We are most grateful for the kind assistance of Marigold Cleeve BA DIP LIB MCLIP Researcher, Carillon War Memorial Museum, Loughborough, UK. The contribution and interest of Mr. & Ms. M. Wakefield is also gratefully acknowledged. Sources: Wylly H.C. (1928) History of the 1st & 2nd Battalions The Leicestershire Regiment in the Great War. Gale & Polden, Ltd. Richardson, M. (2002) Fighting Tigers: Epic actions of the Royal Leicestershire Regiment. Leo Cooper an imprint of Pen & ~Sword Books Ltd. https://en.wikipedia.org/wiki/Siege_of_Kut. 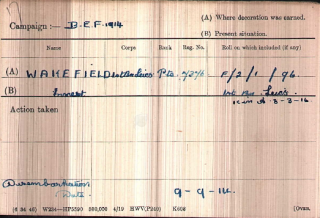 War Diaries of the of the 1st & 2nd Battalions, Leicestershire Regiment (WO 95/1611; WO 95/3945; WO 95/5140). Grantham Journal 1916. Photographs & memorabilia courtesy of Mr. & Mrs. M. Wakefield. With thanks to Marigold Cleeve BA DIP LIB MCLIP Researcher, Carillon War Memorial Museum, Loughborough, UK.